A man was recently sweeping the outside steps of a building at the Human Services Campus in Phoenix. 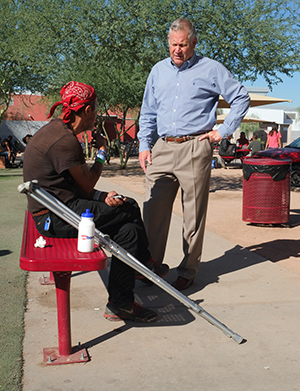 The site is home to more than a dozen agencies serving Maricopa County’s homeless men and women. With a big meeting scheduled, it was no surprise to see someone tidying up. What was startling was the person wielding the broom: Mike McQuaid, president of the board of directors for the campus. He was a key figure in getting the campus built in the first place. An essential force in coordinating the various agencies once it opened. Its first managing director—at a salary of $1 month. And a leader now in the drive to end chronic homelessness within the next few years. One of the campus outreach workers snapped a picture of McQuaid sweeping that day. He wanted to capture a moment that says so much about “the most amazing man I have ever talked to,” the man who helped turn his life around. He was staying in the men’s overflow shelter, just out of prison where he’d recovered from drug addiction and alcoholism. McQuaid “was one of the main keys that made me believe in myself,” he said, choking up as he described the impact, “just to know that there is someone out there that cares.” Now, he has a job, a car, and housing. He’s attending community college with the goal of becoming an alcohol and dependency counselor. Mike talks with employees at the Human Services Campus. In the fight against homelessness, Mike McQuaid has shown for years that he’ll do whatever it takes. He started off volunteering at a soup kitchen almost three decades ago and went on to make the issue a second job. As baby boomers approach retirement age, more and more are looking for an “encore career”—meaningful work that uses their skills. Many are choosing social service, from education to healthcare. For McQuaid, a 68-year-old commercial real estate developer, helping the homeless is an encore and also a parallel. McQuaid graduated from Arizona State University with a degree in business management. 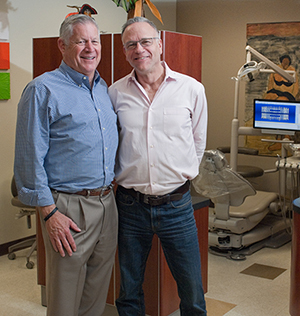 After starting off in the insurance business, he and a partner moved into commercial real estate. They specialize in developing corner shopping centers, anchored by a major supermarket, near housing developments and master-planned communities. Human Services Campus managers update Mike on their agencies. 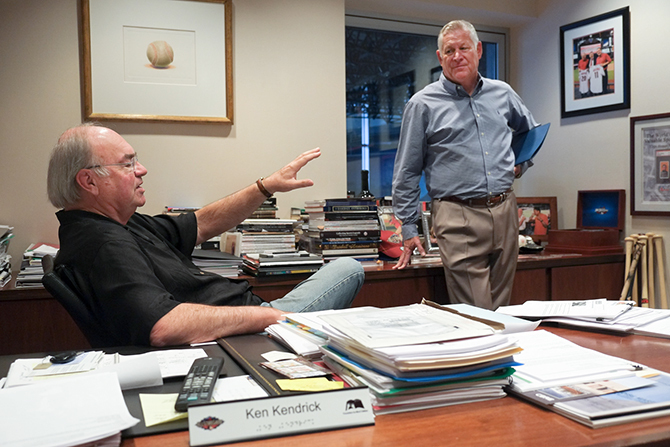 McQuaid took the first steps on the path to his second career nearly 30 years ago. His sons needed to do community service as part of a church project. Through a friend, he heard about André House of Hospitality, a project started by two Catholic priests who cooked food in their backyard and served dinner to the homeless in a nearby park or vacant lot. The plight of the homeless went straight to his heart. “I couldn’t believe there were individuals by themselves, on the street with nothing,” he said. It was a shock to someone who came from a close-knit family that offered a substantial support system. McQuaid began volunteering once, then twice a week. His wife, Molly, joined him. Then André House started looking for a building to serve meals, instead of out in the open. With his business experience, McQuaid was asked to lend a hand in finding a building, and then he helped structure the deal and get everything set up. He became the first chairman of the board of directors for André House. In 1997, the McQuaids went a step further and founded Helping Hands Housing, along with two other couples who volunteered at André House. The nonprofit, dedicated to providing housing for homeless and working-poor families, merged in 2009 with United Methodist Outreach Ministries. “It was just good timing,” is McQuaid’s self-deprecating explanation. His business allowed him some flexibility. He’d always coached his sons in Little League and other sports. But they were growing up, and he was looking for some other kind of public service. The volunteering morphed into a job of its own around 2000. At that time, McQuaid said, “I really started to look at the bigger picture beyond just what André House did.” Wasn’t there a way to create a kind of one-stop shopping for the homeless, so they didn’t have to go to a different place for food, shelter, healthcare and other services? Other nonprofit executives and local leaders were wondering the same thing—especially since two major organizations, St. Vincent de Paul and Central Arizona Shelter Services, were operating out of dilapidated and inadequate facilities. They came up with a proposal for a campus that would house various services. McQuaid became the first managing director of the new Human Services Campus, with a “salary,” as someone jokingly suggested at a meeting, of a dollar a month. He spent two years overseeing construction of the $24 million campus on 10 acres at 12th Avenue and Jackson Street in downtown Phoenix. Funding came from a mix of private and public sources, particularly Maricopa County. More than 1,000 individuals a day now use its services. 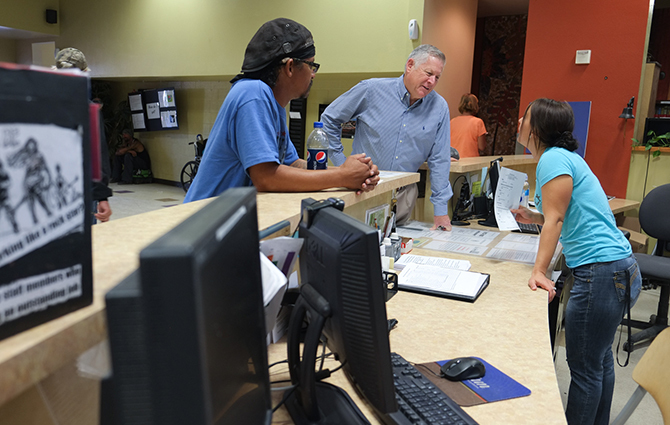 The “anchor tenants” are Central Arizona Shelter Services with shelter and case management; the Society of St. Vincent de Paul with a dining room serving breakfast and lunch, a chapel and meeting-room facilities; St. Joseph the Worker, offering employment services; Nova Safe Haven, serving the seriously mentally ill; and Maricopa County Healthcare for the Homeless. André House is just next door. 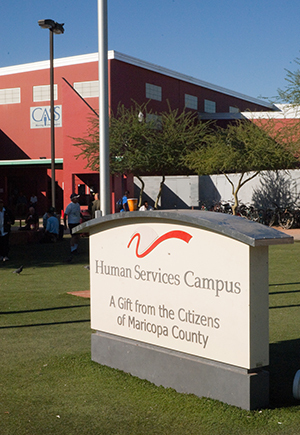 The Human Services Campus is home to 20 agencies serving Maricopa County’s homeless men and women. The campus also led to the development of the Lodestar Day Resource Center, a cooperative effort that puts more than a dozen additional services under one roof. When it opened in November 2005, the campus was hailed as national model of coordinating services for the homeless. McQuaid took on the challenge of getting all the parts to work together. Indeed, bringing people together is one of McQuaid’s professional strengths. McQuaid managed the campus from 2003 to 2010. Now, besides serving as president of its board of directors, he’s treasurer of the Lodestar Day Resource Center. McQuaid knows how to frame the issue of homelessness for his audience, answering the concerns of Democrats and Republicans, conservatives and liberals. He talks about public health, public safety, the right thing to do. McQuaid’s own dedication and track record draw others in. He quickly became a regular, even coming Saturdays, and stayed on until he was named Maricopa County manager in 2012. His example is one reason she decided to follow up her retirement at the end of this year with an Encore Fellowship at the campus. 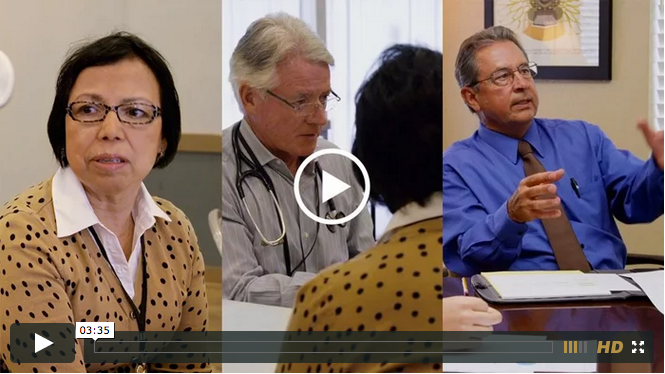 The program, run by the nonprofit, Experience Matters, places professionals in nonprofit organizations half-time for 12 months, is sponsored by the Arizona Community Foundation, BHHS Legacy Foundation, the Bruce T. Halle Family Foundation, the Lodestar Foundation, PetSmart Charities, and Virginia G. Piper Charitable Trust. Mike advising a homeless veteran about services that will enable him to return to Oklahoma. McMullin ended up on Lodestar’s board of directors. He remembers getting a proposal to spend $10,000 to start a ballroom dance program at Lodestar. As a numbers cruncher, he was shaking his head no. But McQuaid told him to be patient. It would all work out. And it did. The innovative program turned out to be a rousing success, giving homeless participants a sense of dignity, confidence, structure and, no small thing in their hard lives, joy. Nonprofits can’t survive in today’s world just by pulling on heartstrings. They need the same kind of solid business plan as, say, a commercial real estate deal. That’s where McQuaid excels. The authority recently approved a $1 million grant request from the Human Services Campus for two projects: housing homeless veterans and building a new welcome center. 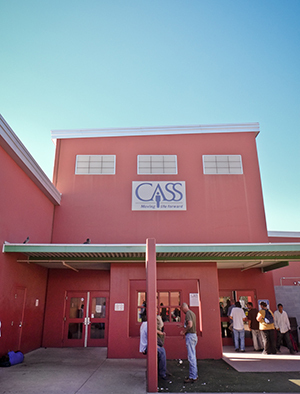 Central Arizona Shelter Services (CASS), located on the Human Services Campus, is the largest provider of shelter and supportive services for homeless individuals in Maricopa County. Everything hasn’t always been on track. McQuaid sees two major shortcomings: the entryway to the Human Services Campus and the persistence of chronic homelessness. And now he’s working on both projects. The Human Services Campus was designed without a central facility at the entrance. “We just literally opened up that big old gate,” he said, and people came in, scattering to various agencies. The physical layout didn’t encourage a unified management for each person’s issues. Thanks to funding from the Industrial Authority and an anonymous donor, the campus will be re-oriented, and everyone will come through the new Brian Garcia Welcome Center. That will create a single processing point, where people’s needs are assessed immediately, and they can be matched up with appropriate services, including housing. McQuaid’s other priority is getting the chronically homeless off the streets. These are people who have been homeless for at least a year or four times in the past three years. Many are struggling with substance abuse and mental-health problems. The common wisdom used to be that housing should come last for these people, after dealing with their underlying problems. That turns out to be upside down: Housing has to come first. “You can’t get clean and sober and mentally stable if you’re on the streets or you’re in the shelter,” McQuaid said. During the economic downturn, McQuaid used his real estate skills to help nonprofits acquire multifamily sites and turn them into “supportive” housing, which includes services on site. Now he and Doug Parker, chairman and CEO of US Airways, are co-chairs of Valley of the Sun United Way’s Ending Homelessness Advisory Council. McQuaid has kept such a low profile in his volunteering, working without seeking credit, that Parker hadn’t heard of him until they served together on the council. Mike takes Erika (blue shirt), his adopted granddaughter, to and from school every day. McQuaid has also been a driver in making the economic case for helping the chronically homeless, Parker said. The community saves money when people aren’t on the street, dialing 911 for medical emergencies or getting picked up on petty criminal charges. Without the pressure of chronic cases, the campus will change its focus, concentrating on those who are newly homeless, who might be able to get back into housing with help making a utility deposit or finding a job. Mike and Molly McQuaid have two sons and nine grandchildren. Their commitment to others plays out in their personal life. They’ve become close friends with a family that has struggled over the years, and one of the children stays with them during the school week. 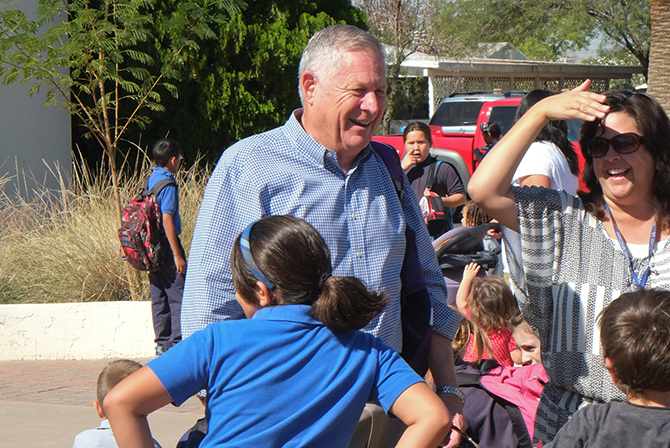 McQuaid takes the 10-year-old to and from St. Gregory Catholic School every day. The family has started a small foundation, which focuses on helping needy students get a Catholic education and assisting the homeless. McQuaid is starting to look ahead as the major projects he’s involved in get close to completion. “I’ll be 70 in a year and a half and finally maybe fulfill my pledge to my wife that this is my last year,” he said. He’d like a teaching role that lets him share his experience with others. It could be another encore career. Legends of an untapped gold mine float through Arizona history. We have found that treasure — and it isn’t the Lost Dutchman’s Gold Mine nestled in the Superstition Mountains. The gold is in the 1.1 million Baby Boomers living in Maricopa County. These folks age 50 and older have education, experience, and a passion to solve hard community problems. They know they have decades longer to live in better health than any generation in history. And they don’t want to “retire” their talents. They are ready for the next stage of life and many want an encore career that builds a new non-profit or helps an agency tackle tough challenges. 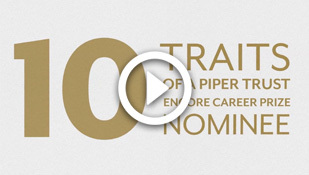 Mike McQuaid, the first Piper Trust Encore Career Prize Awardee, is determined to end chronic homelessness in Maricopa County. In his first career, he was a successful real-estate developer who found time to volunteer with his family to serve meals to the homeless. But he knew services needed to be better coordinated, not spread throughout the community. He led the effort to build and manage the Human Services Campus that houses more than 20 agencies serving homeless people. 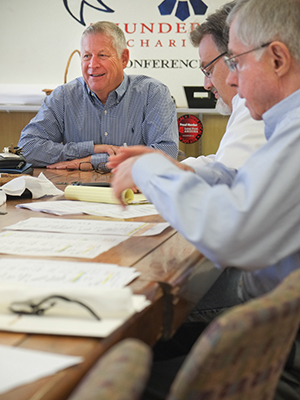 Using his business expertise, he worked with elected officials, the county manager and community leaders to raise the money for as well as plan and build the Campus, the first in the nation and a national model. Today, it serves more than 1,000 people every day. 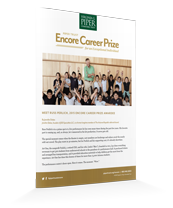 The Virginia G. Piper Charitable Trust will honor an inspiring encore career leader who is addressing a major social need in Maricopa County with a second career. 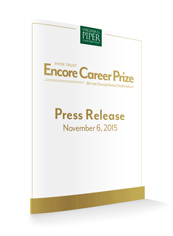 We will talk Mike McQuaid, winner of the inaugural Piper Trust Encore Career Prize.